Jakarta, 29 August 2018 – As one of the biggest electronic money providers in Indonesia, TCASH establishes strategic collaborations with two leading Indonesian enterprises, YCAB Ventures and Indonesia Mengajar. This collaboration realizes TCASH’s commitment to contribute to the empowerment of Indonesian people, through technology development. 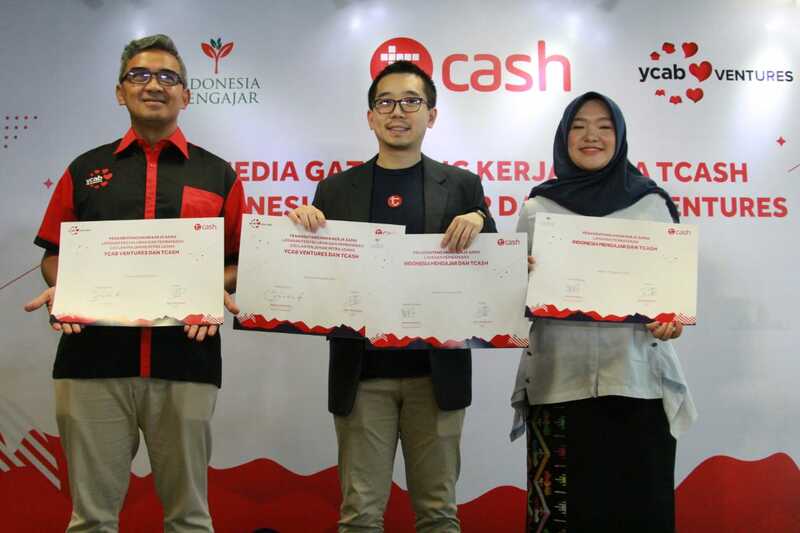 TCASH supports YCAB Ventures as a cashless payment facility for loan-installment program for their micro-businesswomen partners; whereas the collaboration with Indonesia Mengajar will utilize TCASH’s digital donation feature for public fundraising, to support the departure of Pengajar Muda across the country. As of now, TCASH has already provided more than 15 different services, through 3 main user interfaces, namely Snap QR Code feature in TCASH Wallet app; TCASH Tap using NFC sticker; and UMB access code. The collaboration with YCAB Ventures and Indonesia Mengajar will utilize the combination of these three methods, adjusting to each community member’s needs. TCASH supports YCAB Venture’s program to provide loans for their micro-businesswomen partners. The loans will be distributed through TCASH accounts, and can be cashed out easily through retail stores of Alfamart, Indomaret, GraPARI, and Bang TCASH official payment counters. Moreover, the loan installments can be paid by utilizing TCASH’s UMB access code of *800*9222#. This service has been piloted in Rawa Belong, West Jakarta area. “YCAB always thrives to adopt innovative and inclusive approach to support our partners’ activities and businesses. Therefore, we believe that our collaboration with TCASH will provide our partners the much needed efficiency when acquiring loans and paying installments. Considering the easiness of TCASH, we are optimistic that the service will benefit our YCAB community members greatly.”, said Muhammad Farhan, General Secretary of Yayasan Cinta Anak Bangsa (YCAB) Foundation. To utilize TCASH’s installment payment service, YCAB Ventures partners will need to ensure that their TCASH account has been upgraded to full service/premium mode. Not only that it is easier, safer, and faster for loan installments, YCAB Ventures partners can also utilize TCASH diverse services, such as bill payments (electricity, PDAM, BPJS, phone), airtime/data purchase, or other merchant payment. Not only YCAB Ventures, TCASH also establishes a strategic collaboration with NGO Indonesia Mengajar, to support their public fundraising activity. The fund collected from this will be utilized to support the Pengajar Muda program in sending the country’s best youths to be stationed across Indonesia. To support the program, TCASH’s users can utilize the digital donation feature inside TCASH Wallet app, which allow user to easily determine the amount of donation according to their preference. Not only that, to encourage more customer donating, TCASH also conducts a campaign titled “Donation #pakeTCASH – Indonesia Mengajar”, from August 29th– October 31st 2018, in order to maximize the total number of digital donation, to support the departure of 48 “Pengajar Muda” batch 17, which will be stationed in six regions, namely Aceh Singkil, Natuna, Nunukan, Isles of Sula, Isles of Yepen, and Pegunungan Bintang. Beside through TCASH Wallet app, in this campaign, users can also utilize the Snap QR Code feature to donate at some of TCASH’s favorite merchants. “Looking at the increasing trend of a cashless fundraising activity, we believe that TCASH is the most suitable strategic partner for Indonesia Mengajar, in order to maximize our commitment in inviting everyone to participate and support the equal-spread of high quality education access across the country. Supported by the wide network of TCASH, we would like to involve more people to support the cause, as we believe that education is our joint responsibility,” added Haiva Muzdaliva, Managing Director of Indonesia Mengajar. Responding to this collaboration, Danu affirms his optimism towards the services provided with these two NGOs, especially to support the realization of TCASH’s 40 million user target in 34 provinces in Indonesia by the end of 2018. “We are very optimistic that these services will be greatly accepted by all of Indonesian people. We are also committed to support more local NGOs to become the leader of a cashless lifestyle trend shifting inside each of their own community,” closed Danu. YCAB Ventures is a part of YCAB Social Enterprise Group which compromises several entities advancing a shared vision which is an inclusive economy for all. YCAB has evolved from a non-profit foundation focused on sustainable youth development to include for-profit entities which offer products and services to emerging consumers, including microloans to low-income women entrepreneurs conditional upon child enrollment in an education program.